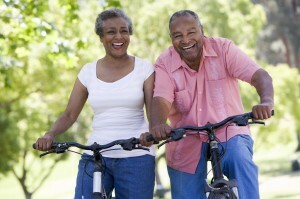 Independent aging is a new approach to senior healthcare. The concept allows seniors to remain in their homes while they grow old. Traditionally, aging populations move to assisted care facilities when they are no longer able to care for themselves. Innovation in medical devices enables seniors to take advantage of the independent aging, or “aging in place,” model. There are various systems available that monitor the health status of individuals and improve their quality of life. As seniors age, they encounter problems with their hearing. It’s common for them to miss taking their medication or miss a ringing phone. Communication also becomes an issue as they struggle to understand the conversation, especially over the phone. Hearing devices such as hearing aids assist with communications, while vibrating wristwatches remind them when to take their medication. Vibrating devices connected to fire alarms notify them of an emergency in the home and send a signal to the fire department to dispatch teams to the scene. Deteriorating eyesight is another frequent problem facing seniors. Conditions such as macular degeneration, cataracts, and glaucoma reduce their ability to see, especially in low light situations. When the utility of reading glasses begins to fade, seniors can turn to “text-to-speech apps” or enlarged print newspapers to help them keep up with the news or listen to audiobooks. Voice-activated cellphone apps allow them to listen to podcasts or search the internet. AI technology enables seniors to write emails and hear replies without the need to read the font on the screen. Independent aging means that seniors are usually home alone for extended periods of the day. During this time, they run the risk of being involved in an accident where they are unable to call for help. Wearable medical alert devices allow them to call for help, without the need to get up. The devices monitor blood pressure and heart rate. If there’s a fluctuation beyond the normal range in their vital signs, the device alerts emergency services. This device is especially useful if the senior experiences a loss of consciousness during a slip-and-fall. The device alerts the medical staff automatically. In such a case, this medical device could save the person’s life. There are many different systems available, read the Bay Alarm Medical review for an overview of how this tech applies to seniors and independent aging. Panic buttons allow seniors to call for help if they notice an intruder in their home. The device emits a signal to a private security form that dispatches a team to their home. The security team has training in first-aid and preventative measures to deal with criminals. Seniors that live in duplexes may have trouble in navigating the stairs. Traversing a staircase may cause a fall and severe injury. Installing a chairlift to the stairs allows them to remain seated while the chair escalates up the stairs. Most seniors have a medication schedule that requires their careful attention. However, seniors living with cognitive diseases, such as dementia or Alzheimer’s disease, may forget to take their pills. In such a case, an electronic medication dispenser linked to a smartwatch sends a vibrating message to the individual reminding them to administer their meds. It’s important to assess the risks the home to prevent accidents like slip-and-falls. An occupational therapist will review each room for potential hazards. Installing handrails on bathtubs, anti-slip mats on the shower floor or under rugs are excellent precautionary measures. Independent aging devices and occupational therapy go a long way in securing a senior’s independence. However, in the majority of cases, some assistance from an aide is required to live a fully functional lifestyle. Aides can assist with preparing meals, assuring good levels of hygiene, and adherence to medication protocols. For more information on government-sponsored assistance programs, speak to your local state authority.